Help Andy to prepare pizzas for his customers. Make click with the mouse on the necessary ingredients to cook the pizzas. Have fun cooking this awesome recipe using tomatoes. Use your mouse to get all the ingredients and follow the directions. Prepare along with this chef a delicious pizza. Mix the ingredients and prepare a tasty tomato sausage, then fry vegetables for the filling, and for the last join the ingredients to prepare the pizza and take it to the oven. Enjoy! Serve your clients what they ask you for in the less time possible or they will get mad at you. Use the mouse to choose the dishes and click over the red arrow to start serving. Help Noelia make these delicious lemon cupcakes. You gotta follow the directions step by step before the time's up. Use your mouse to interact. Do you like the Beans with Bacon? With this game you have the oportunity to learn the recipe. 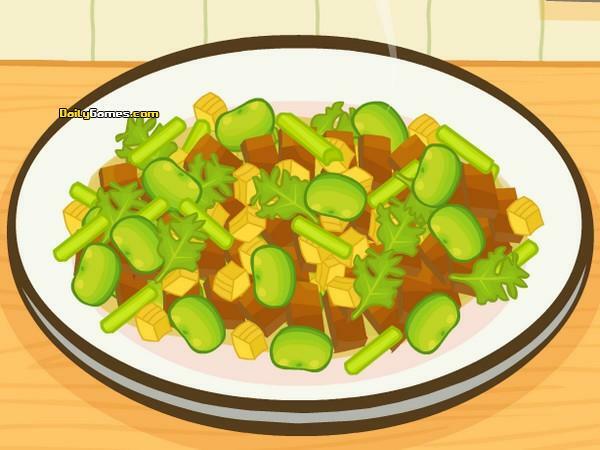 Just follow the steps to cook this great dish! Christmas is here and you're going to have a lot of meetings with friends and relatives, so why don't give them a suprisewith these special snacks? Learn how to prepare them with the recipe on "Sara's Cooking Class" and show your skills as a great baker. Use your mouse. Deliver every order as quickly as possible. Use the mouse to make click on the kitchen elements to prepare the bread, serve the sodas and more. Advance in the different levels to get new dishes or drinks. Help the protagonist to prepare this chicken with affection for the family, starting from the first phase of going to the supermarket to buy the ingredients that you will need... Play / interact with the mouse. You need to learn how to cook a delicious cheese cake following these steps. Use your mouse to add the inredients, mix, bake and decorate.